The Cambo WDS-548 Lens Panel is dedicated for use with the included Schneider Apo-Digitar 43mm f/5.6 XL lens, and facilitates the attachment of the lens to Cambo WDS- and WRS-series cameras for working with a digital back. Cambo has modified this Schneider lens, set in a Copal #0 shutter, by mounting it within a helical focusing mount and attaching it to the dedicated lens panel. This combination permits a minimum focusing distance of 1.3' along with a range of perspective control movements dependent on differently-sized digital backs. The dedicated WDS-548 Lens Panel enables the attachment of the included 43mm f/5.6 lens to Cambo WDS and WRS camera systems along with a medium format digital back. High resolution lens specifically designed for use with digital backs featuring image sensors as large as 40 x 54mm. Produces extremely fine, uniform 110mm image circle with a 102° angle of coverage. An apochromatic design helps to nearly eliminate all chromatic and spherical aberrations to produce clear, sharp imagery that is void of color fringing. Ideal working aperture range of f/5.6 to f/11. Copal #0 shutter affords a range of shutter speeds up to 1/500 sec., as well as bulb and time settings. 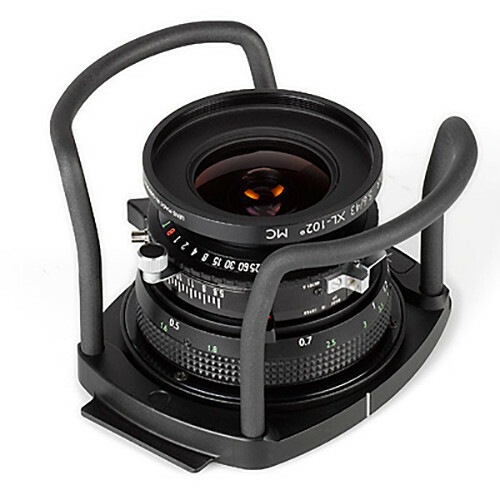 Helical focusing mount enables critical manual focusing on subjects as close as 1.3' away.